Have you ever visited a website that had absolutely no helpful information, or it was just so riddled with ads that you couldn’t even use it? I could make a list of some of the high-ranking websites out there that are culprits of this, but I’ll save that for another article… In the mean time, I’ll show you how to block useless websites from your Google search results so you don’t have to deal with them. This is a feature Google recently added as a follow up to a Chrome extension, but this lets you block websites without installing anything! For this tutorial you will need to be logged into your Google Account. Additionally, this is a very simple fix, so websites will only remain blocked while you are logged into the Google Account that you’ve blocked them on. In your favorite web browser, visit http://www.google.com/reviews/t. 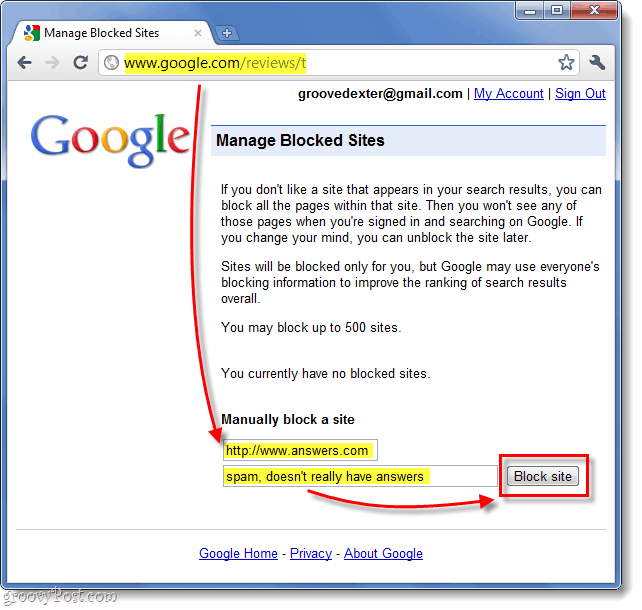 Under “Manually block a site,” Type in the URL of the website that you would like to block. Below it, enter your reason for blocking it. Your reason doesn’t have to be specific; it can be anything from a simple “I don’t like it,” to a story about your life-experience with the website. That was simple! Now the website you entered will never show up in your search results ever again (assuming that you are always logged into your Google Account). To add another website to the list, just repeat the process. 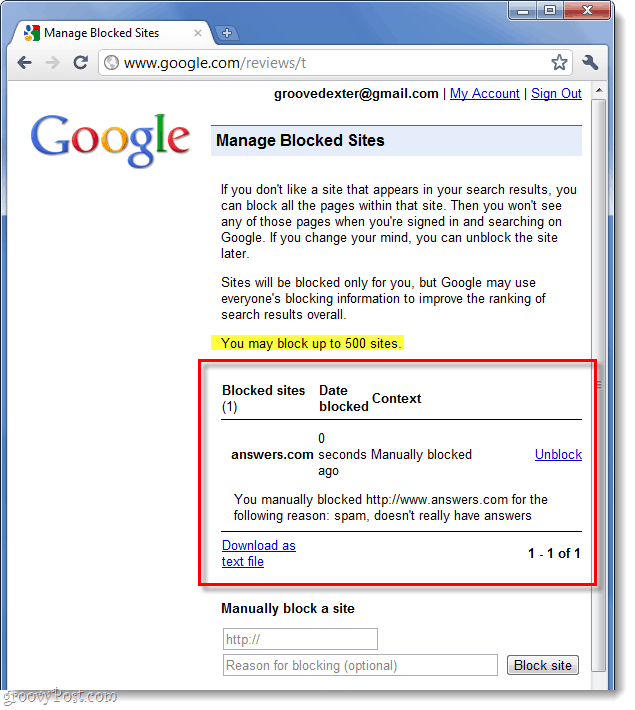 You can block a total of 500 websites from your search results, which is probably more than you’ll need to. One groovy thing is that it lists details about the sites you’ve blocked, when you’ve blocked them and the reason you blocked them. You can even download your list of blocked sites as a text file to easily share it with others. Have a groovy time blocking websites! I’ve been using this for a while now. I think Google will keep an eye on sites being blocked and I’m sure that they’ll find a way to work it into their algorithms. So, hopefully more people will use this an we can all help cut down on these spammy site.